Nucleotide and protein sequences exhibiting high similarity to land plant non-symbiotic hemoglobins (nsHbs) were identified in the genome of the prasinophyceae algae Micromonas pusilla, M. sp. RCC299, and Ostreococcus sp. RCC809. Sequence alignment showed that Micromonas and Ostreococcus nsHb-like globins (Micropusil, Microsp, and Ostreosp nsHbs, respectively) contain the highly conserved Phe B10, Phe CD1, and proximal and distal His in identical positions as in land plant nsHbs. Also, phenetic analysis showed that Micromonas and Ostreococcus nsHb-like globins are closely related to bacterial Hbs and closer to bryophyte than to other land plant nsHbs. This observation suggests that Micromonas and Ostreococcus nsHb-like globins evolved from a bacterial Hb and are ancestral to land plant nsHbs. 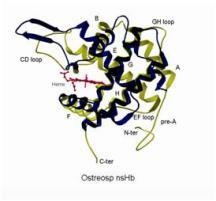 Modeling of the tertiary structure of Micromonas and Ostreococcus nsHb-like globins showed that these proteins could fold into the canonical 3-on-3 myoglobin-fold. Also, analysis of the distance of distal His to the heme-Fe suggests that predicted Micropusil and Ostreosp nsHbs might be pentacoordinate and that the Microsp nsHb might be hexacoordinate.